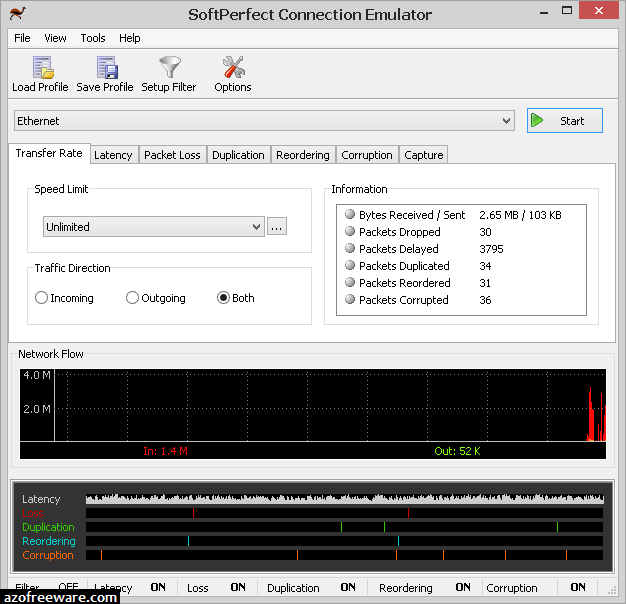 SoftPerfect Connection Emulator (SCE) is a WAN environment emulator for network application developers, system administrators and network engineers. Software developers creating network-enabled applications, especially time-critical ones like VoIP software or real time protocols, need to thoroughly test their products in a range of environments. Most applications work well on broadband connections, but what if your application will also be used on low-speed communication links such as GPRS or Satellite? This is where SCE comes in handy. It imitates a network connection with low bandwidth limits, latency and losses. With SCE you can test how well your application performs on slow or long-distance connections to ensure the quality of your software product. SCE runs on any PC with Windows XP or higher, allowing you to selectively apply bandwidth limits, introduce random or fixed delays on data flows, and simulate packet loss to mimic a low-grade communication channel. 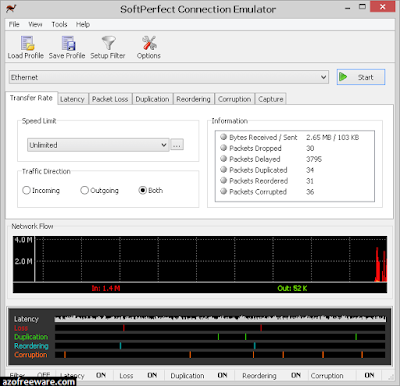 SoftPerfect Connection Emulator is available as an unlimited duration trial, however maximum simulation session is limited to 30 seconds. Purchasing a licence will remove this limitation and allow running lengthy simulations.